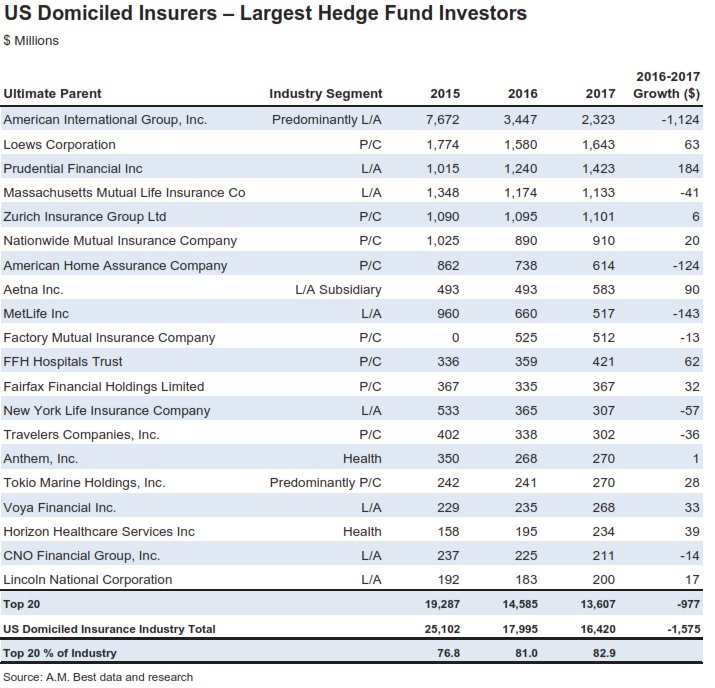 The U.S. insurance industry continued to reduce its risk appetite for hedge fund investments, as holdings declined year over year by 8.5% to $16.4 billion from $17.9 billion in 2016, according to a new A.M. Best report based on year-end 2017 data from the National Association of Insurance Commissioners’ statutory financial statements. The Best’s Special Report, titled, “Insurers and Hedge Funds—The Pullback Continues,” notes that it was the second straight year that insurers pulled back from its hedge fund investments. In particular, the life/annuity sector halved its hedge fund holdings in the two-year period, to $7.0 billion in 2017 from $14.2 billion in 2015 (see first graphic). The property/casualty segment also cut back its hedge fund investments, by 4%, to $8.8 billion in 2017 from $9.1 billion in 2016. The health segment’s holdings have been flat at around $600 million for the last three years; however, holdings are concentrated, as nearly a dozen health insurers invest in this asset class. 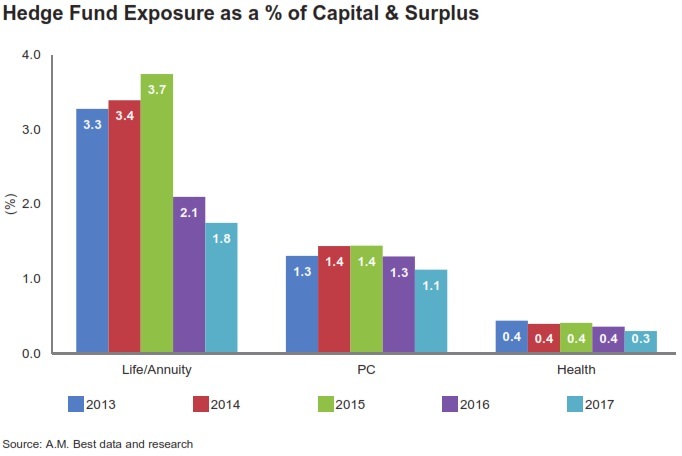 Given the larger scale of its investment portfolios, the life/annuity segment typically has more dollars invested in non-traditional assets, but the property/casualty segment has held more hedge fund investments than its life/annuity counterparts in each of the last two years. 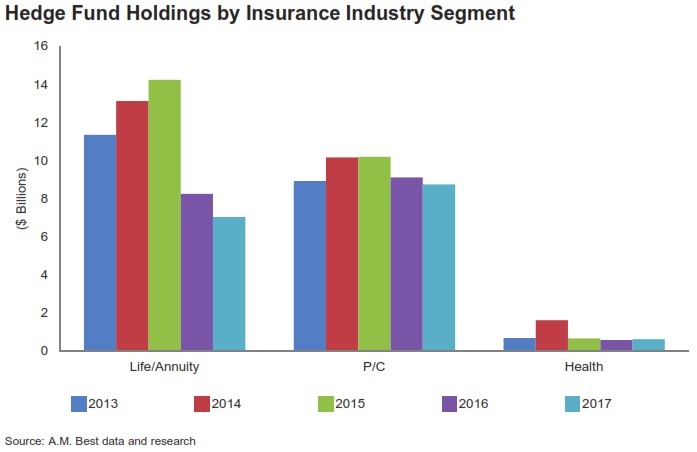 From a ratings unit composite view, individual annuity insurers have been the driving force behind the pullback, with their hedge fund holdings declining by nearly three-quarters over the last two years—60% in 2016 and 34% in 2017 (graphic below). 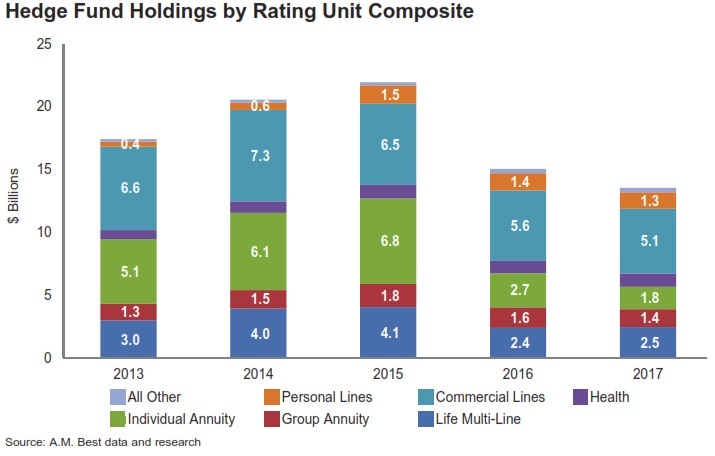 Multi-line L/A insurers have reported a 39% decline since 2015, but these rating units actually increased holdings 3% in 2017, after a decline of 41% in 2016, and now have more hedge fund investments than our individual annuity rating units. Despite three years of declines by commercial lines rating units, they now hold most of the industry’s hedge funds as their pullback hasn’t been as drastic. insurance organizations increased their holdings as those that decreased, although additional investments were much more incremental. Prudential reported the largest dollar increase in hedge fund investments, 20%, followed by Principal Financial, 13%. The report notes (illustrated below) that overall hedge fund exposure as a percentage of capital and surplus for each of the three industry segments is minimal. Although the life/annuity segment holds the largest exposure, it declined to 1.8% in 2017 from a high of 3.7% in 2015 in the most-recent five-year period. Similarly, property/casualty exposure has declined to 1.1% from 1.4% over the same period. Given the sub-par returns in the past few years, A.M. Best would not be surprised to see a continued pullback from direct investments in hedge funds as companies try to ride out the volatility on the sidelines. To access the full copy of this special report, please visit http://www3.ambest.com/bestweek/purchase.asp?record_code=276019.